Russia's Zubr Hovercraft May Finally Justify Use Of "Xtreme"
This admittedly isn't the newest military tech on the block, but The History Channel in us just couldn't help writing it up. 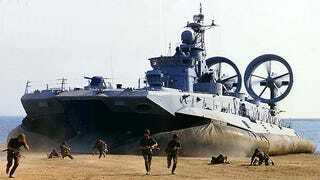 Russia makes the world's largest military hovercraft dubbed the "Zubr." It displaces 621 tons and can haul twice the payload of similar boats from the US Navy (somewhere around 150 tons).